Sitting snugly in the Snowdonia National Park a comfortable walk away from pretty Betws y Coed, Afon Gwyn Country House is the ideal place to come back to after a days exploring. Our position offers guests a feel of the wonderful countryside that surrounds them and is perfectly located in the Snowdonia National Park to explore all of North Wales. So if you want to spend time exploring the mountains and fantastic scenery, visiting the historic sites, climbing, fishing, mountain biking, playing golf or just chilling out, everything is on our doorstep. Reviews - What the real experts say! 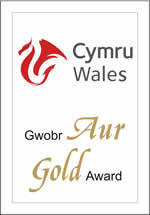 Awarded the Visit Wales - Gold Award 2015 ! 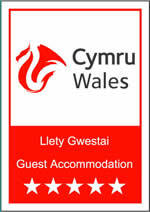 5 Star luxury from £40.50 per person! Price per room, per night based on 2 sharing including breakfast. Special offers and discounts are available from time to time, details are available on our offers page. Single nights stays are charged at the Fri, Sat & Bank Holiday rates. Children must be over 10 years old and will be charged at £30 each per night if sharing a room with 2 adults. Bank holidays is a minimum of a 4 night stay. Single occupancy discounts may be given dependant on availability. A non-refundable deposit equivalent to one nights stay per room is required to confirm all bookings. Our breakfast menu is well worth a peek! Served in the bright conservatory, breakfast is a relaxed affair. With a varied menu to suit all palettes made from the best local produce, we hope to ensure its the best meal of your day. From a full Welsh cooked breakfast to Eggs Benedict and waffles with sliced banana and maple syrup! You wont walk away feeling hungry. and a muffin then drizzled with Hollandaise sauce! Don't take our word for it - check out what the real experts say! Afon Gwyn is located in its own grounds, just south of the beautiful Snowdonia village of Betws-y-Coed. Take the A470 towards Betws y Coed. At the junction with the A5, ignore the signs to Betws and turn left (which looks like it is straight on) on the A5. After 150 yards, turn right towards DOLGELLAU on the A470. After 500 yards the road narrows and you will see our sign and entrance on the left. Take the A5 towards Betws-y-Coed and as you come down the hill, just before the village, look out for a sign on your left for DOLGELLAU and the A470. Take this left turn and after about 500 yards the road narrows and you will see our sign and entrance on the left.